Dual-core tablet runs heavily modified version of Android; will launch on 14th September. 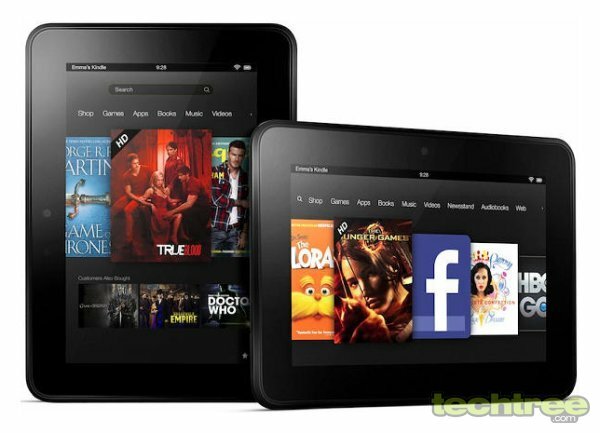 Amazon has announced the second generation of its Android-based Kindle Fire tablet. Dubbed the Fire HD, this newly announced slate has a 7" screen with 1280x800 pixels. As suggested by a recent leak, the Fire HD indeed looks much like the original. 7" IPS panel with pixel dimensions of 1280x800. Screen features 10 point capacitive touch, polarizing filter, and anti-glare coating. 1.2 GHz dual-core CPU, PowerVR GPU. Dual-band, dual-antenna Wi-Fi with hotspot capability, Bluetooth. 16 GB \ 32 GB internal storage. Micro-HDMI port, micro-USB 2.0, 3.5 mm jack with Dolby support. Supported Media: Kindle (AZW), TXT, PDF, unprotected MOBI, DOC, DOCX, JPEG, GIF, PNG, BMP, non-DRM AAC, MP3, MIDI, PCM/WAVE, OGG, WAV, MP4, AAC LC/LTP, HE-AACv1, HE-AACv2, AMR-NB, AMR-WB, HTML5, CSS3, MP4, 3GP, VP8(.webm). 7.6" (l) x 5.4" (w) x 0.4" (10.3 mm) (d), 395 grammes. The Fire HD offers integrated support for Facebook, Twitter, Skype, and various email clients. It runs a heavily modified version of Android, and does not have access to Google's Play Store — so users will have to depend on Amazon's Appstore. The Fire HD is priced at $200 for the 16 GB version, and $250 for the 32 GB. It's currently up for preorder on Amazon.com, and will start shipping on 14th of this month. There's no word on availability in India yet.